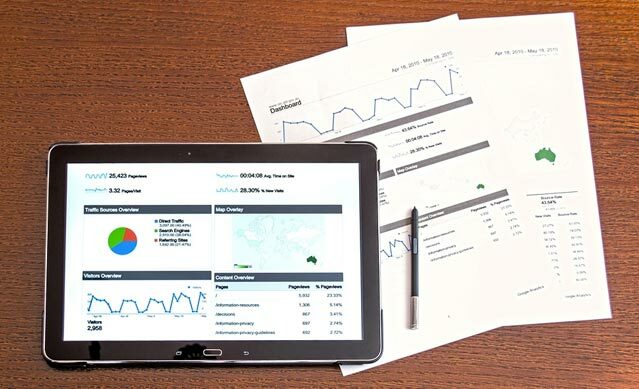 In a world of fluctuating demand and soaring competition, retailers are turning to data analytics to elevate overall profitability and improve internal business processes. One such retailer from the Middle East approached Matrix & Vectors to implement a data-driven approach to streamline operations and optimize capital deployment. With several foreign brands under its belt, this retailer sought to identify and monitor individual store performance to enable better resource and capital allocation. Here’s how Matrix & Vectors leveraged the power of data analytics to give the retailer’s business a timely boost. 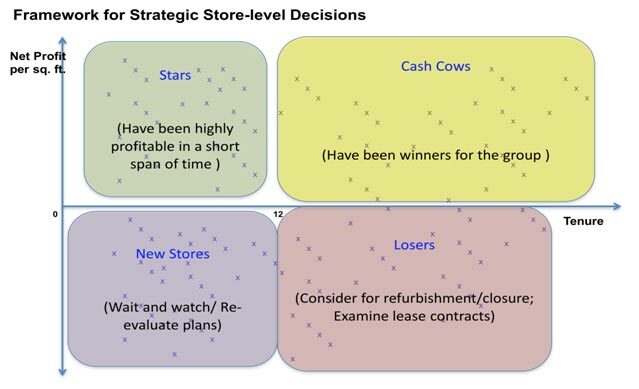 With this matrix, we were able to recommend an adaptive capital allocation strategy – a flexible alternative to the retailer’s current investment model. 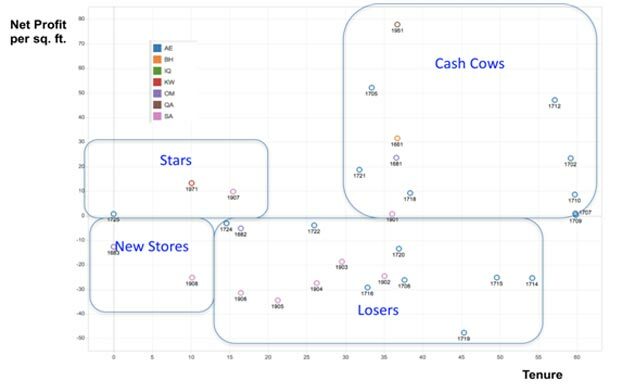 We concluded that the best way forward was to close all non-performing stores (Losers) and reallocate the residual capital to Star Performers, Cash Cows, and other profitable stores. While 67% of retailers understand the importance of operational efficiency, only a mere 27% know how to achieve it. However, with a data-driven approach to driving operations, retailers can now efficiently make crucial decisions to maximize profits year after year. 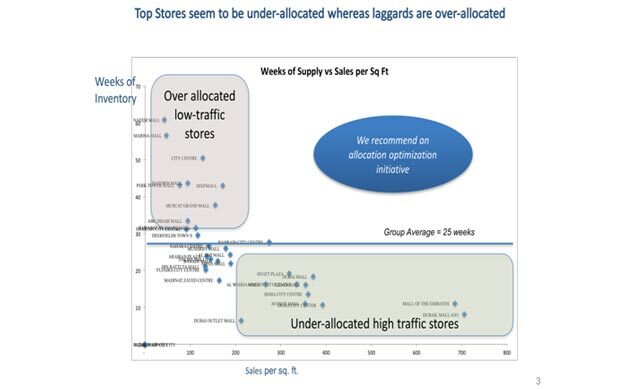 By studying the retailer’s sales per sq. ft. vs weeks of inventory for the previous year, we classified stores into two categories – fast-moving stores and slow-moving stores. 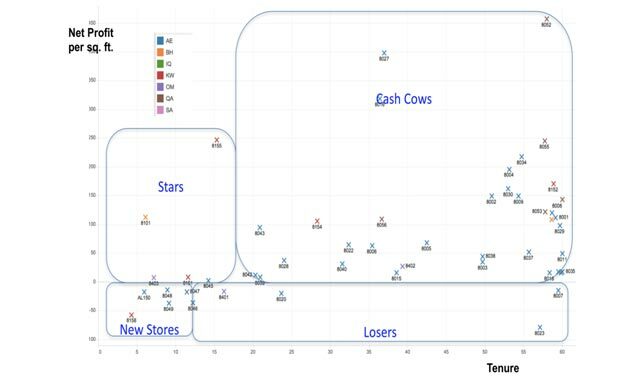 A simple scatter plot revealed that the former were understocked and the latter were overstocked. This led to a double whammy of a loss in business opportunity in the fast-moving stores and accumulation of inventory in the slow-moving stores. We then recommended that the retailer readjust stock allocation to ensure higher profitability and consumption of stock. We also performed Sales Forecasting to determine the critical factors driving sales and predict buying volumes. A similar exercise was then carried out across all of the retailer’s other brands. 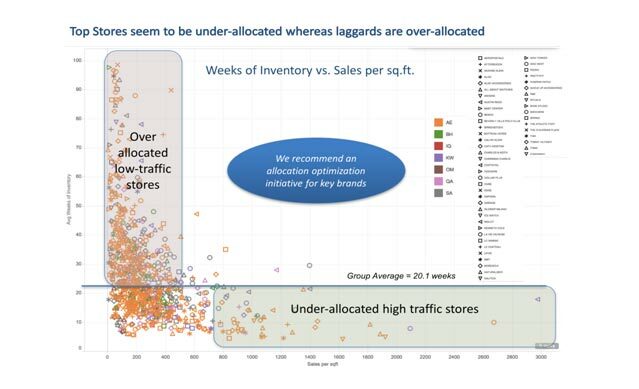 By using a data-driven approach to decision making, the retailer recognized the need for better capital allocation and inventory management. This then enabled them to shut down unprofitable stores and bolster the capabilities of the profitable ones – paving the way for sustainable business performance.